Will the iPad 3 be the iPad HD? Apple is expected to drop the numbering moniker from its next-generation iPad, calling it the iPad HD instead of iPad 3, according to reports. The HD would stand for the higher-resolution Retina display, which would have double the linear resolution of the current iPad 2 screen. Mashable, VentureBeat and CNet each reported that the new iPad will be named the iPad HD when Apple unveils the device Wednesday. Their story is also corroborated by an earlier discovery of alleged part listings from accessory makers Griffin and Belkin, as well as usage data from an application called Tapatalk. By all accounts, calling the new tablet iPad HD makes sense. That’s mainly because the most notable feature of the new Apple tablet is meant to be the higher-resolution display, which would have double the linear resolution of the iPad 2, from 1024 by 768 pixels to 2048 by 1536 pixels. The iPad HD display’s resolution would be higher than full 1080p HD video resolution at 1920 by 1080 pixels, and should display much sharper images. At 9.7 inches and double the current resolution, an iPad 3 display would have just over 260ppi pixel density. The only comparable Android tablet at this resolution is the Transformer Pad Infinity 700, with a 10.1-inch 1,920 by 1,200 pixels resolution screen. Another significant feature that could make its way onto the iPad HD is 4G LTE connectivity and a quad-core chip dubbed the A6. The chip would have twice the power of the dual-core A5 found in the iPad 2 and iPhone 4S, making it powerful enough to drive the high-resolution display. The introduction of a high-resolution screen on the new iPad would have several implications. First, this means developers have to upgrade the graphics in their apps to match the sharper display of the iPad HD. Because the new tablet would have exactly double the linear resolution of the current iPad, the transition will be relatively smooth, if the resolution doubling from the iPhone 3GS to iPhone 4 is any indication. Most apps now support the iPhone 4/4S Retina display, while on older devices the apps graciously revert to the smaller resolution. You can still find apps in the App Store that are not optimized for the Retina display, and the graphics look slightly blurry, which is probably something users of the iPad HD will encounter in the first stages of the transition. 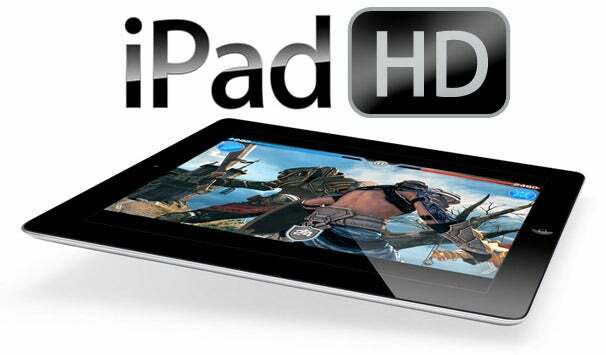 Another consideration of the high-resolution iPad HD display could be storage size. Higher-quality graphics for apps would mean that the application sizes will increase significantly, especially for games and other graphic-intensive apps.